The Impressive Health Benefits Of Apples Really Do Keep The Doctor Away! We all know the well known phrase “An apple a day keeps the doctor away”. Today I am going show how the superb health benefits of apple have given rise to this famous meme. Apples are from the same family as pears: the Rose family. Depending on the variety, the white fleshed fruit can be crisp and crunchy or “powdery” to the bite. They vary in sweetness, flavor and tartness. Apples can be yellow, red or green. Most of an apple’s nutrients are stored in or just beneath the skin. Apples are known as an excellent source of pectin and dietary fiber. They are high in vitamin A and C and a good source of essential minerals such as potassium, calcium, iron and phosphorus. They contain the phytonutrients: ellagic acid, malic acid, chlorogenic acid, and quercetin. There are many more phytonutrients in an apple, some yet to be discovered and named. These compounds are high in antioxidants, anti-inflammatory and anti-cancer properties. To enjoy the numerous health benefits of apple, eat raw or add to your daily fresh juices. Alzheimer’s and Parkinson’s diseases: Studies have shown that eating an apple every day offers protection against Alzheimer’s and Parkinson’s, diseases that affect the brain and its nerve cells. Asthma: Asthmatics who drink apple juice daily will encounter less wheezing and fewer asthma attacks due to the high vitamin C and anti-oxidant compounds. Athletes: Moderate exercise is good. But intensive or strenuous work-out/trainings will create oxidative stress in the body. Drinking apple juice after trainings will neutralize the harmful oxidants, replenish the vitamins/minerals, as well as reversing muscle tiredness and stiffness. Be sure that the apple juice is not oxidized as this will add to the oxidative stress that is harmful to the body. Atheroslerosis: High LDL cholesterol in the body is dangerous when there is oxidative stress occurring. The high anti-oxidant compounds from apple will help neutralize the oxidation, reducing the danger of the plaque build-up and clogging of the arteries that lead to atherosclerosis. Arteriosclerosis: Regularly consuming vitamin C-rich apple juice will retard the development of hardening of the arteries. Bone Protection: The high potassium content of apples prevents loss of calcium in the blood which in turn helps prevent loss of calcium in the bones. Daily eating/drinking an apple helps preserve bone density and prevents osteoporosis. Constipation: Drinking apple juice mixed with carrot juice is a sure way to ease constipation. If badly constipated, keep drinking this combination until bowel moves… and it will! Dental Care: Chewing on an apple helps clean the teeth and maintain healthy gums. The anti-septic effect of apples keep bacteria and viruses away; and reduces the incidence of dental cavities. Diabetes: Green apples are great to be consumed by diabetics for its fiber. The apple polyphenols help prevent spikes in blood sugar with enzymes that help break down complex carbohydrates. Digestion: Apples contain a natural laxative. When drunk as juice, it helps aid bowel movements. It is most effective when mixed with carrots and spinach juices, you can expect bowel movement the next day. Regularly eating apples also will ensure bowel movements due to its gel-forming fiber, pectin, which improves the intestinal muscle’s ability to push waste through the gastrointestinal tract. Regular bowel movements mean lower chances of colon cancer. Fibromyalgia: Apple is one of the best sources of malic acid, which plays an important role in improving muscle performance, reversing muscle tiredness after exercise, prevents muscle stiffness, reducing lethargy and boosting energy levels. This makes it a great help for people suffering from fibromyalgia. Gallbladder stones: The malic acid in apples is great for softening gallbladder stones for easy elimination. Read more on how to consume apple juice for a gallbladder flush to superboost your health. Lung Cancer, Prevention: The high content of the flavonoids quercetin and naringin combined with the anti-oxidants in apples are effective compounds in preventing lung cancer. It is recommended to use the green variety for juicing. Green apples make an ideal base for most juice recipes. They are of superior quality and have wider variety of enzymes. Being not too sweet and mixing well with vegetable juices, they are also suitable for diabetics. 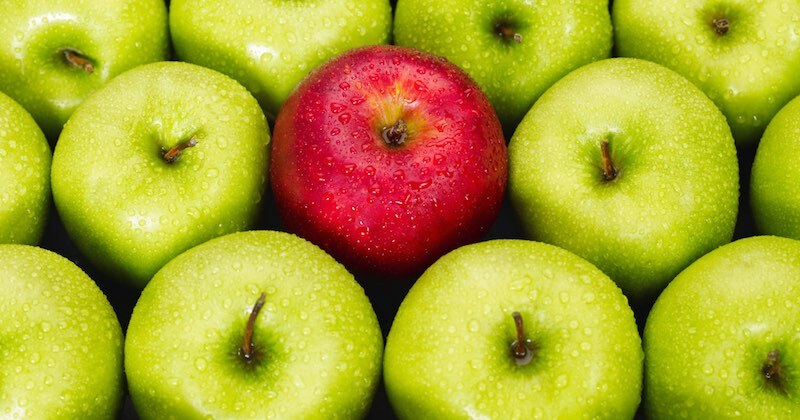 Red apples tend to oxidize faster than the green ones. Read here about why I prefer to use Granny Smith apples for juicing. Do not store damaged/spoiled apples with the good ones as they produce ethylene gas that will hasten the spoilage of other apples. This is why we hear, “one bad apple spoils the whole bunch”. To prevent sliced apples from browning (oxidizing), put them in a bowl of cold water with a spoonful of lemon juice. When giving apple juice to your toddler, dilute the juice with one part water. When giving to young children, give juice from no more than one apple to prevent gas and diarrhea. There is debate about whether or not apple seeds are safe to be included in juices. Apple seeds contain a very minute amount of cyanide, so minute that you would need to eat at least 80–100 crushed apple seeds a day to have any negative impact on your health. Assuming each apple has 10 seeds, you will need to consume eight or more apples with their seeds before any adverse effect kicks in. In any case, when you juice using a slow juicer, the seeds get crushed and expelled together with the pulp. However, it is a different case if you blend apples with the seeds. Then you consume the apples and seeds. Still, you will need to eat at least eight or more in order for it to have any adverse effect. It is quite impossible to be eating 8 or more apples a day with the seeds. The wax on apples are mostly non-petroleum based and safe for consumption. However, if you’re concerned, go for organic apples. One way to remove the wax is by brushing with a fruit brush although you may not get it off completely. If you use a centrifugal juicer to make your apple juice, you will notice that the juice turns brown very rapidly. This is oxidation, and oxidized juice is in effect, spoiled juice. To prevent this, add lemon when juicing apples, and feed them in to the machine alternately. If you are serious about juicing, invest in a quality slow juicer which will address the two problems above (wax and oxidation). Gear juicers will remove the wax from the juice, expelling it out in the pulp. Secondly, a gear juicer that runs on low RPM will preserve the nutrients and enzymes and prevent juice oxidation.